He sounded downright evangelical! The peer pressure from the 'scientists' not to question the great Gore-Al was thick with CO2 clouds and thoughts ofclimate change research greenbacks. Yes, scientists, please get involved in the debate. We need your expertise to keep the debate accurate. Monitor your community's editorial page for inaccuracies and refute them. May I suggest that you start with George Will's February 15th column. Dr. Will should do a post and explain what he is doing to help those with paralysis or traumatic brain injuries....I'm waiting to see my sister think clearly and walk again. I don't subscribe to Gore politics....but I am an advocate for alternative energy sources....too me though it will be a reality when you see all the middle class and low income with solar panels on their roofs....until then it's just 'running the mouth' to appease 'change'. Testimony and anecdotal evidence based on memory is a biased and unscientific method to measure anything. A similar example would be eyewitness testimony, which has been shown to be inaccurate, subjective and/or malleable based on beliefs and stressors. At the moment the theory of global climate change is supported by the evidence (this is where I would cite my source, but there are so many it should be common knowledge by now). Fringe studies and interpretations of the evidence exist to refute the theory, but so far have not captured the consensus of science. Good science is being done on the subject, the majority of scientists in the applicable sciences have weighed in in favor of the current theory, as it's projections have proven fairly accurate. If in fact they are mistaken make no mistake that it will be discovered. Too many people are working on this issue to let a false theory stand. Imagine the recognition behind disproving it, I would love to be that scientist! However, for the layman to say "I don't believe in climate change" is just as ridiculous as saying "I don't believe in evolution". A more accurate saying would be "I don't know enough to make a decision on the issue". But I see people aren't comfortable with admitting ignorance. As far as Al Gore and the rest, there is a reason the scientific community honored him and his team with the Nobel. Not liking him politically is a poor reason not to listen to his message. Too many people are thinking with their guts and not with their heads in as far as his message is concerned. The level of ignorance and irrationality exhibited by the deniers of anthropogenic global warming in these comments is really appalling. You folks REALLY believe that hundreds of climate scientists from all over the world who have studied this matter diligently for decades, in some cases risking their lives to do so (for example the paleoclimatologists who drill for ice cores in Antarctica), including every major scientific organization in the world, including every national scientific academy of every advanced nation on Earth, are ALL engaged in a massive "liberal" conspiracy to perpetrate an enormous hoax on humanity - and ONLY Rush Limbaugh is telling you the truth! And whenever anyone even mentions Al Gore you instantly begin howling with rage and hatred. Good grief, you are like trained seals. The ExxonMobil-funded pseudo-conservative propaganda masters have done their job well - they've got you jerking around like puppets on their string. If anthropogenic global warming were not the grave threat that it is, your willful ignorance would be comical. Unfortunately, given the reality of the threat, it is tragic. Effect of CO2, on average surface temperature, is Zero. Y'all can say and do what you will. Y'all can believe or disbelieve, that is your right as a human being. I use both solar and wind to produce my electricity. I drive an all electric car. The bottom line is: I save literally hundreds of dollars per month. The last time there was a power failure in my area my house was like the "energizer bunny", it kept going and going and going. We were never in the dark. My car is recharged using the solar and wind generated electricity. Drawbacks? Yes! Some of my neighbors resented the fact I had electricity and they didn't. The "electric company" is not happy with me, either. And I am sure OPEC is not happy. If I save the environment, that is a bonus for y'all and the future generations. I personally like the money I save and not having any inconveniences, like black-outs. I can't believe everybody who thinks Gore is the Global Crusader. If you check his home has one of the largest carbon footprints in the US for single persons. Unlike some other well known homes who have gone "green" like Kennebunkport estate of (yes the Bushes home) have gone to using wind turbines for their energy needs. These people who are blowing the horn of doom like chicken little don't really understand that global warming actually means the opposite and that is why the Northern states are getting colder winters. As for the loss of arctic ice, it is a normal cycle of weather that has been going on for eons. Al Gore is nothing but a big bag of hot air and as I remember took a canoeing trip in the Northeast during the worst drought and they raised the river level so he could take this trip. Some Ecologist!!!!! Does anybody even stop to think about all the volcanoes that are active right now and the billions of tons of sulfuric ash that is being spewed in to the atmosphere? From the sound of it I guess not. SecularAnimist: gee, it took you 3 paragraphs before you mentioned Rush Limbaugh! Before Exxon-Mobile even. You do realize that the money spent on private research of the global-warming farce pales in comparison to what Gore-Al has pulled down over the last 7 years. 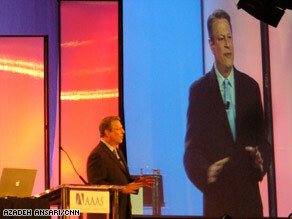 Is Gore Dumb, or Stupid, or a Criminal of global proportions ? Long list of financial fraudsters, why is not Gore investigated ? Climate change eh... thought it was global warming last year?... I'm behind the times. I'm pretty sure climates change... saw a stuffed furry elephant once. 2010 is next year... either (Climate Change) man made or not seems to be the trend... however I'm sure there is room for the next big scare. How the government supports the Gore agenda ? What taxes does the Church of Gore pay ? The deniers of anthropogenic global warming seem resolutely determined to show by their example that the human species is too stupid to survive. It's so sad to see so many rationalizations. Using reason is to study all the evidence collected by experts in thier respective fields and arrive at a decision based on it. This is how people make informed decisions. It may not be that you arrive at the same conclusion as other rational thinkers, but at least you will have arrived at it fairly. I’ll start worrying about going GREEN when I see Al Gore squeeze into a pair of bicycle shorts and rides to work. But as long as he’s flying private jets and has his limo’s wait with the motor and A/C running while he lectures to us, I’ll worry about more important things. Al Gore stands to make many millions off his investments in businesses which feed off global warming hysteria and carbon trading. He is totally committed to touting manmade warming whether it is cocuring or not. What he says is irrelevant to the fact that the planet has been cooling for ten years and that CO2 cannot and never has controlled our climate. Now that he calls it "climate change" because he knows it is not warming, he is trying to tie carbon controls to national security to further legitimize increasing unreasonable controls over our lives and the world economy. He cannot be trusted, from the lies in his movie to his lie about our current warming. He is a political hack from beginning to end. The fact that he gets all of these awards indicates that the general higher public, who are supposed to be the brighter part of our population, do not have a clue regarding the real state of our climate and the real science involved. They are a bunch of followers. Alas, my hope for intelligent discourse has been dashed. I guess I'm not surprised. I hope for all our sakes your ill thought out rationalizations are correct and its all some big conspiracy to make money and make you afraid. "It is not possible to elevate the surface temperature simply by further emissions"
I happened to be reading a blog about denialism and thought about this blog-which brought me back here probably too late to give a meaningful response. I checked out your "website" source. A single scientist debunking global warming would make a much bigger splash than the Quarterly Journal of the Hungarian Meteorological Service. Find some concrete anti AGW examples in highly respected and strictly peer reviewed journals such as Science and Nature and perhaps you would have something scientific to go on. I suspect you arrived at your conclusions as so many others have – based purely on ideology that has nothing to do with science. Disagreement exhists among the consensus of scientists as to the mechanisms behind AGW, not its existence. To suggest otherwise by citing an unknown scientist publishing work in obscure journals and using mostly his own previous research as source material is at best disingenuous. I think there are ample sources to follow up on in the two links provided. They should lead you to good science published in peer reviewed journals that command high levels of respect among members of the scientific community due to the rigorous review processes used. If you look back on this old blog post, I hope I've left you with reasonable information. Reason it out - or have the Bankers do $cience for you ? Since we like web based information now. Here is an interesting site that I hope you find helpful. Could not find forest growth increase - is there a rebuttal ?